Adult specimen; neutral colour pattern. 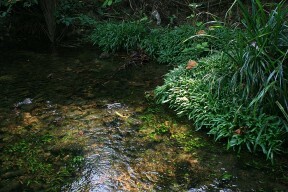 A habitat of B. siamensis in Ranong province, Thailand. In its natural habitat, Ranong province, Thailand. Specimen from Ranong in the aquarium showing pale stress patterning. 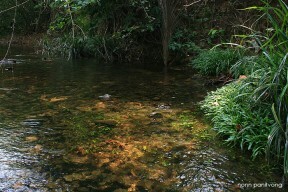 Another view of the habitat in Ranong. 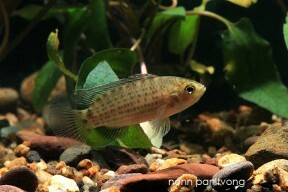 Specimen from Ranong in the aquarium.. Endemic to Peninsular Thailand where it has only been collected from river systems draining the western coastline in the provinces of Ranong, Phang Nga, Phuket, Krabi, Trang and Satun. Unconfirmed but expected to occupy typical Badis habitats i.e. 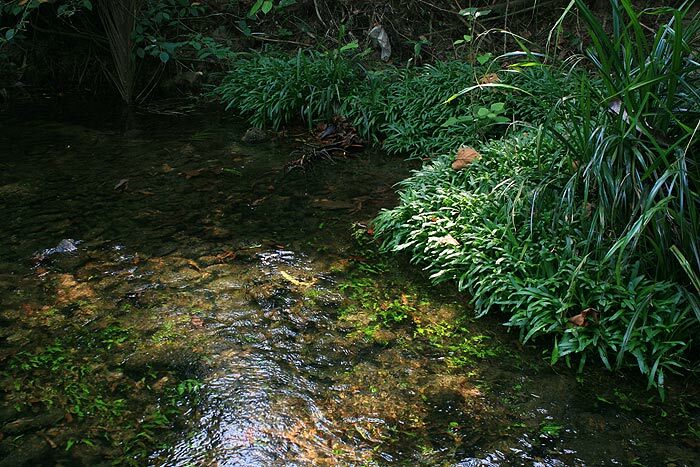 shallow, slow-moving streams and pools with dense marginal and/or submerged vegetation. B. siamensis will thrive in a well-structured set-up with a sand or gravel substrate plus plenty of water-worn rocks and pebbles to provide cover. Plant species that can be grown attached to the decor such as Microsorum, Taxiphyllum or Anubias species can be added if you wish but aren’t essential. Temperature: Prefers slightly warmer and more constant temperatures than most badids within the range 22 – 26 °C. If you do intend to house it in a community tankmates must be chosen with care. It is slow-moving with a retiring nature and may be intimidated or outcompeted for food by larger/more boisterous tankmates. 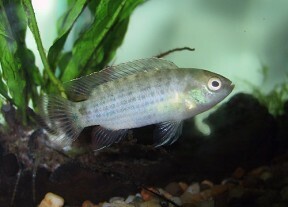 Peaceful, scholling cyprinids are likely to make good choices as are gouramis and other surface-dwelling species. Accommodating it in a biotope-style community of fish from southwest Thailand is trickier although suitable species found in the region include . Certainly do not combine it with similar-looking, territorial bottom dwellers such as dwarf cichlids unless the tank is very large and never house it with other Badis species as hybridisation might occur. Also note that freshwater shrimp of the popular genera Caridina and Neocaridina, and certainly their young, may be preyed upon. 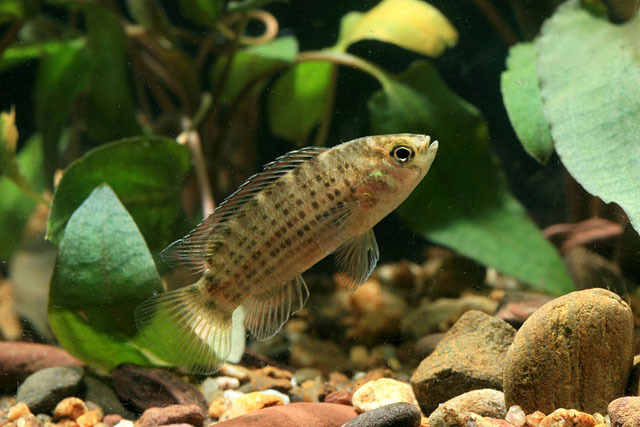 Females are smaller, have duller patterning and a noticeably shorter, rounder-looking body profile then males. Males also develop slightly extended finnage as they mature. Members of this genus are cave spawners that form temporary pair bonds and are not usually too difficult to breed provided the tank is arranged correctly (see ‘tank set-up’). 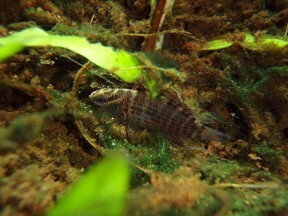 Other species are best omitted if you want to raise good numbers of fry although in a mature, well-furnished community a few may survive to adulthood. Either a single pair or a group of adults can be used but if using multiple males be sure to provide each with a cave to defend. Water parameters should be within the values suggested above. Feed the fish with plenty of live and frozen foods and spawning should not present too many problems. Like most badids this species is poorly documented and has yet to find significant popularity in the aquarium hobby; to date it has only been exported in very limited numbers. It was for a number of years known as Badis badis siamensis and will be seen labelled as such in older literature. Within the genus it is most easily confused with B. khwae and B. ruber but can be identified by the flank patterning which consists of rows of horizontally-arranged dark markings. In B. ruber these appear more in the form of vertical bars while in B. khwae they are absent altogether. The three also differ in the shape of the dark marking on the caudal peduncle; in B. ruber it is relatively large and extends over the dorsal surface of the peduncle, in B. khwae it is noticeably smaller and in B. siamensis reduced even further or missing in some cases. Posterior to the caudal peduncle marking B. ruber exhibits three more, smaller dark spots at the caudal fin base, B. khwae a dark bar and B. siamensis some faint blotches.